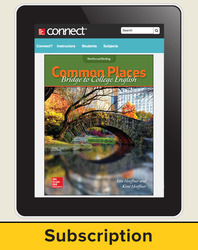 1-year subscription to Connect® for Common Places: Bridge to College English. Lisa Hoeffner earned a Ph.D. in English with a specialization in rhetoric from the University of Houston. Since 1998, Dr. Hoeffner has served as both professor of English and professor of reading at McLennan Community College in Waco, Texas. In addition to her teaching roles, Dr. Hoeffner focuses on curricular redesign in developmental education. She serves as grant director for a Texas Higher Education Coordinating Board grant awarded for work on improvement and innovation in developmental education. With the advent of integrated reading and writing in Texas, Dr. Hoeffner has provided leadership for colleges across the state that are creating integrated reading and writing (INRW) programs and has provided leadership to public school districts implementing INRW programs as college preparatory classes. Kent Hoeffner earned a B.A. from Texas A&M University in College Station; an M.Div. from Golden State Seminary in Mill Valley, California; and a Ph.D. from Southern Seminary in Louisville, Kentucky. He has served at McLennan Community College since 2001, first as the division director for liberal arts and currently as a professor of philosophy. In 2007, Dr. Hoeffner developed McLennan's first online philosophy course, and since then has continued to develop and teach various online courses. Most recently, Dr. Hoeffner renewed his long-standing involvement in academic advising by joining a group of faculty in a grant-funded intensive advising program focused on improving the success of developmental students. He regularly mentors students who need help in the areas of successful academic behaviors, self-advocacy, and the development of college-level reading and writing skills.